This could be the front panel of the iPhone 5. The latest leak shows what claims to be the front housing of the next iPhone. If genuine, it looks like Apple's next handset will sport a 4-inch screen, as widely expected. 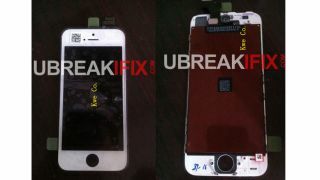 The picture follows other leaks including the case, the insides, and the screen. But this is the closest yet we've come to seeing a finished model. The handset is also expected to be just 7.6mm thin. That's nearly 2mm thinner than the iPhone 4S. Rumours abound Apple will announce the next iPhone on September 12. iPhone 5 pre-orders for the handset are expected to go live the same day, with the device going on sale on September 21. Previous rumours said Apple would wait until October, a full 12 months since the iPhone 4S launched. However, international orders aren't expected until early October. The second round of shipments, which reach international customers, are expected to start on October 5. Apple named its latest iPad simply the 'new iPad', casting doubt on the name of the iPhone 5. Some think the numeral will make it seem old hat, in the same way Police Academy 7 sounds a bit tired, so Apple could well drop it. iOS 6 is expected to launch in the autumn as well, so regardless of the exact shipping date, and name, it's clear we don't have long to wait for the next iPhone.